Rudy stands in front of his regal mahogany bookcase stocked full with classics like the Iliad, the Odyssey, and Arabian Nights. He holds a shrink-wrapped booster box parallel to his messy plume of hair. It’s Dark Ascension, the 57th expansion for the card game Magic The Gathering. “Anytime I could get these boxes for $70 and below, I was buying ‘em, because nobody wanted ‘em,” he says, eyes downcast while he paces back and forth. “I was like, ‘How is nobody seeing this? Why are these prices still where they are?’ A lot of people don’t have the ability to see the distance. They don’t have that ability to really see everything.” Rudy swings the camera around to reveal a cardboard wall built from a phalanx of Dark Ascension boxes. Hundreds of them, stacked to the ceiling, blotting out the light from the windows. Rudy the Magic Guy is the most prominent figure in Magic The Gathering’s financial underbelly. His vlog, Alpha Investments, hosts 102,000 subscribers. 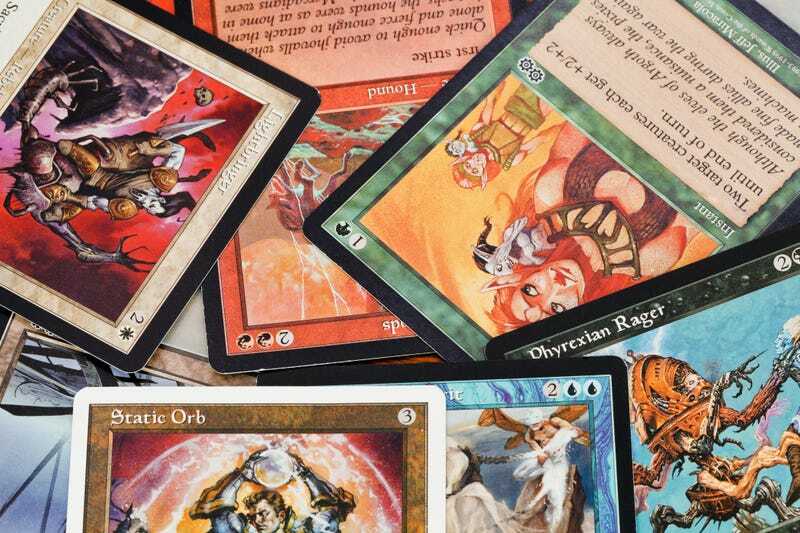 Some are attracted to his trenchant, occasionally profane analysis of the twists and turns of the secondary Magic market, where pieces of a children’s card game sell for hundreds of dollars. Others, like me, are simply intrigued by the ridiculous excess of his craft. In some videos he flexes the glut of 20-year-old game store boxes laying dormant and unopened in his garage. Sometimes he offers introductory advice, like the benefits of investing in single cards vs. factory-sealed packs. But my favorite, by far, is when Rudy documents his trips to Magic conventions across the country, where bright-eyed customers plunk down a couple Benjamins for the privilege of cracking open one of the vintage boosters he sells. The foil wrapping is seductive; maybe the cards inside are worthless, or maybe there’s a $1,000 Tabernacle waiting to be unearthed. Magic The Gathering wasn’t always a collector’s item. In the early ‘90s a scientist named Richard Garfield approached game publisher Wizards of the Coast with an idea for a board game called Robo Rally. They turned him down, because his prospective design was too expensive for the company’s then-meager production capabilities, but they asked if he could come up with something lighter and faster to play. Garfield returned with the concept for a collectible card game (CCG) in which players would tear open randomly-sorted booster packs in hopes of unwrapping powerful cards to add to a store-bought starter deck. Magic The Gathering made its debut in the July of 1993, and by the end of the summer Wizards had already sold out of their initial 2.6 million card print run. Fads pass through the global nervous system all the time without appreciating any real value (nobody is throwing money into Pogs in 2017), but Magic has remained consistently popular over the last 24 years. One of the key things that keeps its value stable is a corporate decree called the “Reserved List.” In 1996, Wizards guaranteed that a handful of cards from the game’s earliest sets would never be printed again in “a functionally identical form.” This decision was made after a disastrous 1996 expansion called Chronicles. Essentially, the Chronicles set included some cards that were reprinted from previous Magic runs, thus flooding the market with duplicates and torpedoing the profit margins of the rares and uncommons sitting in early investors’ collections. Plenty of people who don’t enjoy the disposable income necessary to buy their way into a goldmine of Alpha Rares still manage to make money in Magic. In the mid-’90s, the most expensive Magic cards were worth a couple hundred dollars. In 2017, the company still maintains the Reserved List, and the value of the cards included on it has exploded. Take the Magic card Black Lotus, effectively the Shakespeare’s signature of Magic cards. It is monstrously powerful, a relic of the game’s old-fashioned ‘90s imbalance, and because of the Reserved List, it was only printed in those rickety early sets. You could play the Black Lotus from your hand for free and immediately tap it to gain three mana, of any color, into your pool. The combo potential is so sickening that in Magic’s traditionally laissez-faire Vintage format, which allows players to build their decks from practically every Magic set that’s ever been released, it’s forbidden to include more than one Lotus in your decklist. Chang can remember a time when Black Lotuses were pushed around card shops for $50, or blithely traded for mediocre creatures by people who didn’t respect its power. Things are different now. In 2013 a 9.5-graded Alpha Black Lotus sold for $27,000 at auction. Today it goes for around $15,000. There are plenty of reasons for this: it’s powerful, it’s iconic, the art is beautiful, but most importantly, Wizards of the Coast’s mandate makes sure that the card will only get scarcer as time goes on. That being said, plenty of people who don’t enjoy the disposable income necessary to buy their way into a goldmine of Alpha Rares still manage to make money in Magic. A lot of small-time sharks on the secondary market have adapted to a bazaar without the rubber-stamp of the Reserved List guiding the path. Tarkan Dospil is one of them. He’s an executive at Quiet Speculation, a for-profit software hub that combines advanced analytics with tried-and-true hunching to stay ahead of Magic market trends. Dospil hasn’t had an honest-to-god Magic collection in 15 years, (he only plays in booster drafts at his local game store), but he opted to invest some cash into the game after receiving an interest-free credit card in the mail. Magic The Gathering is a cultural institution, but it’s not quite 1920s baseball or the golden age of Hollywood—at least not yet. Dospil compares the secondary market to an elaborate stock exchange, one he monitors with digital algorithms, price aggregation tools, and a massive network of e-commerce hubs that swap, he says, “millions of dollars in cards every day.” The tangents that drive the commerce can mutate in a moment’s notice. A good example is the prestigious Magic Grand Prix tournament that happens four times a year. The top players in the world show off the best decks in the game for a chittering Twitch audience. Inevitably, the core, game-winning cards in those decks immediately spike in value. If you’ve got a keen enough eye to predict those trends, you can make a pretty penny in cardboard. Of course, that works both ways. Someone like Dospil is not protected by the endorsed rarity of the Reserved List. The value of a card like Vryn’s Prodigy is tied to its power level and usefulness in a particular metagame. If that changes, so will the profitability. “Collectibility has less impact on the most recent sets,” he says. According to Dospil, the secret to mastering the modern Magic market is through keeping a finger on the pulse of the competitive scene while also looking out for weirder, unique cards that attract the casual end of the fanbase. We often forget about the millions of kids playing Magic on their parents’ dining room tables, who would rather spend their allowance money on a cool creature with a dramatic effect than a min-maxed counterplay. Dospil calls this the “invisible hand” of the Magic community. There are other pitfalls, too. Both Dospil and Rudy tell me that buyouts have become a common problem. In Dospil’s words, a buyout is when an individual or a cabal of conspirators buy all the publicly-available copies of a card and “reintroduce the asset into the marketplace at an egregiously high price.” He says this is mostly an issue for the older, rarer cards, but he’s seen it happen with modern fixtures in the meta, particularly after an innovation in a popular deck takes hold in the mainstream. He also recommends that those with a significant amount of cash should skirt the modern game entirely and dump their capital into the vintage sets. “Those are the marquee items for collectors and are the safest places to invest, long term,” explains Dospil. Magic is a cornerstone of geek ethnology—there are entire game stores that subsist exclusively on booster packs and tournaments—but still, the idea of doubling-down into foil-wrapped cardboard might make most people a little queasy. Those $20,000 Black Lotuses are only 24 years old. Compared to say, Action Comics #1, Dorothy’s ruby slippers, or the Beatles and the babies, that price tag can look a little suspicious. We’ve all seen collectibles die a fast, heartbreaking death, as the rug is pulled out from under a legion of investors who hung their hopes on a false promise. Magic The Gathering is a cultural institution, but it’s not quite 1920s baseball or the golden age of Hollywood—at least not yet. Rudy doesn’t agree. Obviously he recommends real estate and rental property as more sensible investments than children’s card games, but he advises that once you’ve got the rest of your finances sorted, there’s no problem in dumping money into Black Lotuses.”If you are stabilized, and living a non-volatile life, I don’t think there’s anything wrong with [investing in Magic],” he says.